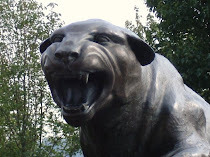 CARDIAC HILL - A Pitt Panthers Blog: Class of the Big East? That's the question I'm asking shortly after Pitt's ten-point win AT UCONN. Pitt's now gone on the road three straight times and come away with three wins for the first time in its Big East history. Factor in the competition in a top 10 team, top 15 team, and a team that was previously ranked, and in the words of Judge Smails the teams they've beated have been 'no slouches.' UCONN, on the other hand, is left with yet another defeat to a ranked opponent. Beating UCONN three straight times feels mighty good. The early reports are in and folks are just now starting to catch on, it seems. I always find myself rushing to the box score and flow chart immediately after the game looking for something specific. Tonight, I was looking for UCONN's number of layups or points in the paint. Had Pitt lost, that would have been the main reason why. The verdict? According to ESPN.com, 19 of the 25 field goals were layups or dunks. No that's not a typo. I knew it was bad, but no idea it was THAT bad. What's even worse was that 12 of their 13 FGs in the second half were layups or dunks. I've been watching basketball for over 20 years. I honestly can't remember ever seeing a college game where a team got so many easy baskets. They had a lot of transition points and seemed like they were in the paint all night. Pitt's defense wasn't the greatest - ESPECIALLY in transition. But perhaps that makes the win that much more impressive. To win by ten in a rivalry game on the road when (and this is key) you didn't play your best game gives me a good feeling. "We came in at halftime; I told them we got beaten on the boards by four. We had to turn that around." "We out rebounded them by 13 in second half, and clearly that was the difference." The silly talk about Pitt perhaps not making the tournament should be over. As I mentioned before, this IS a tournament team. And not only a tournament team, but a team that can challenge for the conference title. Starting 4-0 in the conference and winning your last seven games will make you think like that. Funny thing is, I keep waiting for the team to falter. I'm convinced it will happen, but when? I figured this would be a much harder game, but the fact is that had UCONN not gotten so many easy buckets, it would have been much more lopsided. Brad Wanamaker had his first good game for Pitt in Big East play, scoring 19 to co-lead the Panthers along with Ashton Gibbs. It was a good thing as Jermaine Dixon didn't have a particularly strong game. On the flip side, Travon Woodall looks like a mess out there at times. I don't know if it's because he's not getting as many minutes or whatever, but he was completely wreckless with the ball lately taking bad shots or throwing it away. The fact that we never see Chase Adams out there makes me think he must be somehow even worse. And in the middle, Gary McGhee is painfully mediocre. I almost think he cancels himself out because for every good putback or rebound he gets, he gives up another. And it's clear that Dante Taylor has much less leeway than McGhee does. Taylor was called for a moving screen (which was no worse than some of McGhee's) and he came right out immediately. McGhee allows offensive rebounds or makes a piss-poor effort blocking someone out and he stays on the court. Granted, he played better tonight, but Dixon's intolerance of Taylor's mistakes seems like a pattern. 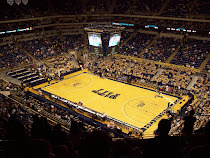 UCONN, like Pitt, on the other hand doesn't have the same look as in previous years. But even with strong performances by players at times (i.e. Stanley Robinson tonight) are really without a key leader according to folks in the area. I don't know. Pitt really doesn't have a leader if you think about it. Ashton Gibbs? Can a sophomore really lead a team even if he's their best player? Gilbert Brown? Fresh off a suspension and he doesn't even start yet. Jermaine Dixon may be the closest to the team leader and he's certainly not a definitive one and has only been in the program as long as Gibbs has. I don't know how much that plays into it. The Fab Five went to the National Championship game with a starting lineup composed of freshmen. For once it's nice to get the edge on free throw shooting - Pitt shot 85% to UCONN's 46%. As absurd as it sounds, if Pitt can beat Louisville at home (which could be a daunting task because of their press), Pitt will have a look at getting to...*gasp*...25 games. Yea, Gary McGhee is mediocre. But he played extremely well last night. His defense was tremendous. He was physical and made it tough for the UCONN big men to score buckets. He also pulled down 9 boards and hit both of his free throws. I thought it was the best game he's played all year. I have to admit this team has really turned the corner with Brown and Dixon coming back. Jtads - You're right, it may have been his best game of the year. He's just so frustrating to watch sometimes, though. He makes a great play, then gives up an easy rebound. His man-on-man defense is pretty decent and he doesn't commit a lot of dumb fouls. However, he often gets outhustled for rebounds and at times, has hands of stone. He is what he is, though. And yesterday, it was good enough for Pitt. James - Yes, the team looks much more comfortable. The key is that even though Dixon had a poor shooting night last night, his being out on the court is invaluable because of his defense. I also meant to include this in the original post, but Gilbert Brown is a freak. I never really bought into the NBA talk about him, but his ability to get to the basket as well as developing a jump shot (and even 3-point shot) makes me think he's got a shot. I wouldn't be all that surprised to see him come out next year and average around 15 a game. This team is gaining a ton of confidence... can't wait to see this team come march.